This work presents the results from a series of plane strain compression experiments on medium-density sands. In these experiments, a new type of plane strain experimental apparatus and the incremental reliability-guided digital image correlation (RG-DIC) technique are used to research the localized deformation of sand specimens. The new apparatus can reduce the influence of boundary constraints in the experiments. The RG-DIC technique can not only obtain the full-field deformation distribution on the surface of sand specimens to analyse the evolution of the shear band in sand but can also determine the characteristics of the shear band, such as its inclination and thickness. Additionally, a methodology applying bifurcation and statistics has been devised to estimate the moments when the shear band begins and penetrates. These two moments can divide the compression process into three parts: pre-failure, in-failure and post-failure. According to an analysis of the deformation and assumptions regarding the plane strain model, the localized volume can also be estimated. 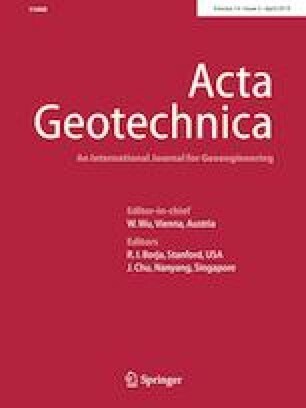 The experimental results indicate that the RG-DIC technique performs well in geotechnical tests of large-scale deformation. The work was supported the National Natural Science Foundation of China (No. 51309047).